For those that like to collect vintage synths or don’t have a clue where to start in choosing one, be prepared to be rocked hard. IK Multimedia’s Syntronik, a virtual synth for MAC and PC, offers up a staggering amount of virtual synths (38 to be precise) and controls to tweak and layer making for a neverending combination of ways to create music. To start, the interface is easy to use and get a feel for. You’ll immediately notice the four columns that break everything down, starting with a visual of the synth, then filter categories, then the sounds available from that synth, and once you choose the sound, you have a photo of the synth with a brief description. 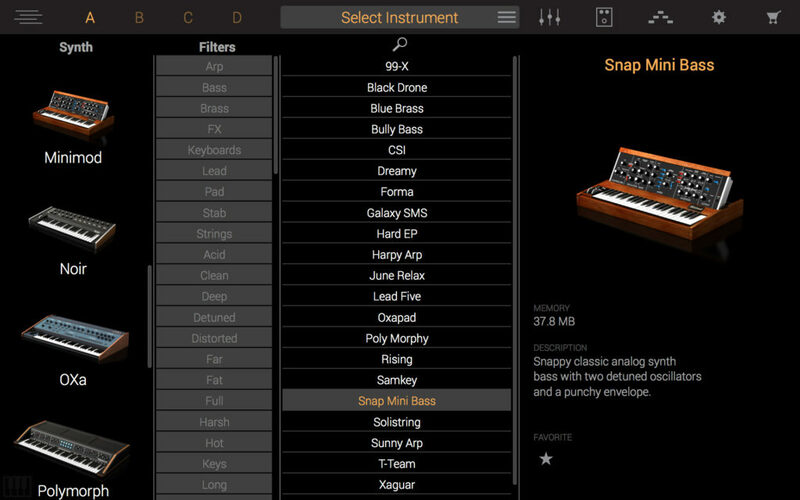 While most of this is self-explanatory, the filter section is truly unique as it offers a variety of categories to choose from, that I didn’t think were necessary at first but quickly became useful, like the types of sounds (Electric Piano, organ, sound FX) to styles of music. Every sound also has a star next to it so you can click it to save in your user category under the filter section for easy retrieval. Other sections on the interface include on the left: A, B, C, D for layering up to four synths, and on the upper right: controls for layer volume, effects, arpeggiator, settings and a link to the sound store to purchase additional synths if you choose to buy a synth engine one at a time, like in Sample Tank. The only thing I would like to see is a further visual breakdown of synths. After a while it gets confusing as the sounds are sometimes shared among synths and I really enjoy visually seeing all that each synth offers. Another slight hindrance of Syntronik is that when you click on a sound to use, there is a short load time that varies depending on the size, which disrupts the flow. It’s not enough by any means to not buy this but you should be aware. Hopefully it’s something that can be fixed down the line with an update. There are many parts to this machine that make it special but one of the main standouts include 17 instruments (available as a collection or separately) that offer over 2,000 preset sounds from an astounding 38 of the most iconic to ultra-rare vintage synthesizers. This all equals over an astonishing 50GB of samples in total! But what makes this engine beautiful is the quality of the multi-sampled synths they recorded, keeping every synth on point, and showing the uniqueness of each synth’s sound. So, the more modern synth sounds are modern and the vintage synths come across with a great vintage vibe. Another great feature that helps to preserve the original feel of some of these older synths is their DRIFT™ technology. It’s something that actually does a great job of reproducing the behavior of oscillators from real hardware synths. So when you press down on a key, it not always sounds the same. 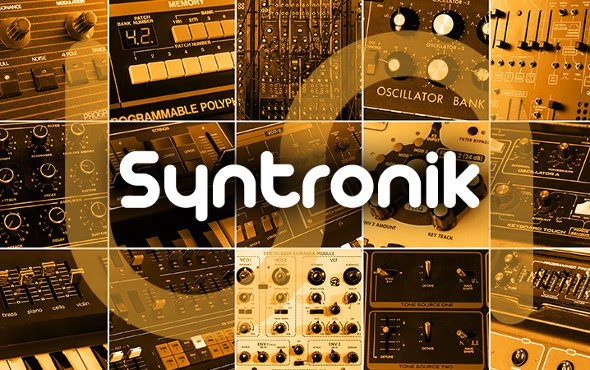 Syntronik is also effect rich so you can use the original synth sound and strip it of all features or layer up to four effects including splits and arpeggiators on top of each other to create truly unique sounds. The options here are truly endless and this is where Syntronik both shines and can also overwhelm. The 38 instruments included in Syntronik are: Modular Moog, Minimoog Model D, Moog Voyager, Moog Taurus I, Moog Taurus II, Moog Taurus 3, Polymoog, Moog Opus 3, Moog Rogue, Realistic Concertmate MG-1, Multimoog, Micromoog, Moog Prodigy, Sequential Circuits Prophet-5, Sequential Circuits Prophet-10, ARP 2600, Oberheim SEM, Oberheim OB-X, Oberheim OB-Xa, Yamaha CS-80, Yamaha GX-1, Yamaha CS-01II, Yamaha SY99, Roland Juno-60, Roland Jupiter-8, Roland Jupiter-6, Roland Jupiter-4, Roland JX-10, Roland JX-8P, Roland JX-3P, Roland TB-303 Bassline, Alesis Andromeda, PPG Wave 2.3, ARP String Ensemble, Elka Rhapsody 490, Hohner String Performer, Roland RS-505 Paraphonic, Roland RS-09 Organ/Strings. Is there room for improvement with Syntronik, of course, but barely. Will I be using it in my workflow making music? Absolutely. I can’t wait to add some of these synth textures to my tracks. The only question is if the quality of my tracks will match up to these synths!